AMMONNEWS - The Lower House's Foreign Affairs Committee on Thursday met with Minister of Foreign Affairs and Expatriates Ayman Safadi. MP Nidal Taani, who chaired the meeting, spoke about the recent political developments related to the Palestinian issue, Jerusalem and the Syrian crisis, noting that the meeting aimed to review thess developments. The committee he said, fully supports stance of His Majesty King Abdullah II on various issues, mainly the Palestinian cause and Jerusalem. The foreign minister also spoke about Jordan's position on the Palestinian issue, which was reaffirmed by His Majesty during the Arab Summit which was held in Tunisian late March. 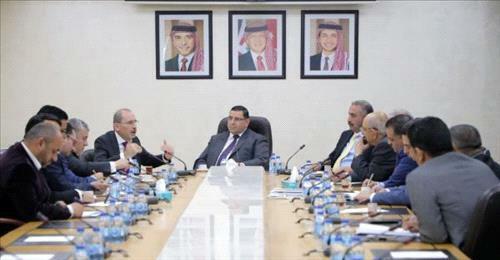 He said that the Palestinian issue will remain a top priority for Jordan, noting that the Kingdom is coordinating with its Arab brethren and friends on developments related to this issue. "Jordan does not know what the United States will offer regarding the so-called "Deal of the Century", but the whole world knows our constants and our position that the fulfillment of all the legitimate rights of the Palestinian people, primarily the right to freedom and the state with Jerusalem as its capital on the lines of June 4, 1967 is the only way to resolve the conflict. " Safadi added. On the Syrian file, Safadi said that Jordan, since the beginning of the Syrian crisis, called for a political solution that is accepted by the Syrians, preserves the unity and stability of Syria and provides conditions for the voluntary return of Syrian refugees. He pointed out that the file of Jordanian detainees in Syria is a priority pursued by the ministry through all channels in order to ensure their release, adding that the number of detainees has reached 30 since the reopening of the borders between Jordan and Syria. As for the three Jordanians kidnapped in Libya, Safadi said that information obtained by the foreign ministry confirmed that they are safe, noting that the ministry is working with the Libyan government to ensure their release.